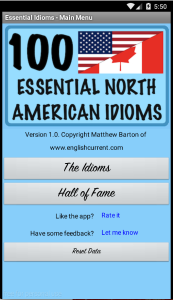 *New*: Download the Essential North American Idioms App on Google Play ! My students often tell me that they want to learn idioms. But, in the past, I always found it difficult to find a list of idioms/phrases that was general enough to be useful for everyone. So, I finally broke down and made my own idiom and phrases list. Below is the result of hours of idiom compilation and writing. off the top of your head He asked me to tell him a joke, but I couldn’t think of one off the top of my head. I am North American, so naturally, this list contains idioms that are most familiar to English speakers in North America. There are approximately 195 idioms, totaling 11 printed pages. Don’t try to teach them all right away! Progress slowly, and finish them off page-by-page over the course of six months or so. It’s difficult to divide idioms into difficulty levels. I tried to begin the list with the easiest/most common expressions and then finish it with slightly more specific/advanced idioms. Many of the idioms on the last few pages are work-related. Maybe save 15 minutes of class to study idioms. Don’t spend a whole class on idioms. Only cover 7-8 idioms with your students (you don’t have to do a whole page) or they won’t remember them well. Always review the idioms you studied in the previous class. Here is a good warm-up activity (requiring pictures) to review them. After you have taught 10 or so idioms, do this role-play activity to give your students a chance to use the expressions in conversation. 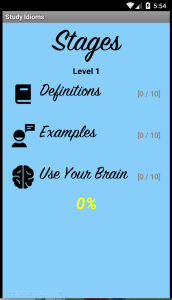 Now you can study 100 of below idioms on your Android mobile device! Visit the Google Play store to download the app for free. The app has 100 of the most useful North American idioms (taken from the list below), grouped into 10 levels based on difficulty (intermediate, upper-intermediate, advanced). A: Do you know April O’Neil? B: Hmm. Maybe. That name rings a bell. On the one hand, Peter’s roommate is kind. On the other hand, he’s quite messy. I tried to keep an open mind about Allan even though I’d heard some bad things about him. His name was on the tip of my tongue… but I couldn’t remember it. Tyler was too hung-over from last night’s party to go to work. I’m fed up with my neighbour’s dog. It takes you 15 minutes to walk to school? Big deal! = a sarcastic expression meaning that sth is actually NOT a big deal. My dad gave me a hand with my homework. It was going to be a surprise party, until Todd let the cat out of the bag. If you think you can make the team, then give it a shot. A: Can I invite my brother? B: Sure. The more the merrier. = used to say that the more of sth there is, the better it will be. Even though I lost the race, I gave it my all. I saw the accident happen, first-hand. Let’s not take this path. It leads to a dead end. When Dana has something on her mind, she likes to go for a long walk by herself. I use my watch to keep track of time. My aunt made the cake from scratch. He asked me to tell him a joke, but I couldn’t think of one off the top of my head. The boy learned his lesson. He’ll never play with fire again. The professor told his students to keep in mind that they only have 50 minutes to complete the test. Timmy was afraid to speak his mind in front of his schoolmates. It rained on my only day off. Just my luck! The house party got out of hand, so we had to call the police. To cut a long story short, Lisa and I have had some interesting experiences together. break the ice At the start of the meeting, Mike tried to break the ice by telling a joke. I went out of my way to help Jenny find an apartment, and she didn’t even say thanks! I don’t like being in the car with Gary. He has difficulty controlling his road rage. The old man went on about his school days for nearly an hour. I was going to return the library books today after work, but the thought slipped my mind. The baby threw a fit when I took his toy away. The ball is in their court now. Let’s wait for their decision. Finding a fifty-dollar bill on the ground made my day. = used to say that sth made your day special (and great). I get a kick out of reading science fiction novels. The bright advertisement caught my eye. I jumped the gun and asked Gail to marry me. She said she wasn’t sure what to say. = to do sth too soon. The angry worker gave his boss a piece of his mind. Kate crossed her fingers and hoped it wouldn’t rain on her wedding day. The designer handbag cost her an arm and a leg. Ken was in hot water about forgetting his wedding anniversary. in a bind Susan is really in a bind. She has two essays due tomorrow and she hasn’t started either of them. Ted plays squash when he needs to let off steam. You can figure out the author’s opinion by reading between the lines. We went all out and booked a five-star hotel for our trip. Mark’s comment was out of line. He shouldn’t have said that to a client. My manager is on my back about being at work on time. I wouldn’t be seen dead wearing an ugly dress like that. Larry has mixed feelings about his new job. When asked for her postal code, Amy drew a blank. Jim has been a mechanic for 20 years. He really knows his stuff. Businesses were closing in town left, right and centre. After seeing a mouse on the floor, I had a change of heart about eating at the restaurant. Peter told his boss that he wouldn’t quit. He’s in it for the long haul. George was the only one man enough to admit he had made a mistake. The apple pie at this restaurant is second to none. It took me a month to learn the ropes at my new job. The new employee, Gail, is a breath of fresh air in the office. The coach told me that if I didn’t get my act together, I’d be kicked off the team. Eric has his heart set on participating in the Olympics. Keith took it for granted that his girlfriend would always stay with him. Then, one day, she was gone. A: How long will you stay in Australia? Greg invested his money in a few different areas. He didn’t want to put all his eggs in one basket. A: It’s funny that all of Kate’s friends are attractive. B: So is she. I guess birds of a feather flock together. = similar people tend to spend time with each other. I’m starting to have second thoughts about my new apartment. Don’t touch my stuff. If you do, you’ll pay the price. Darryl’s ex-wife is a total basket case. We arrived at 8 o’clock on the dot. I don’t have a clue where Nunavut is. Our team has a shot at winning the championship. It took only an hour for word to spread around the office that John had been fired. I arrived home from my trip safe and sound. My brother is a real pain in the neck sometimes. The governments of Portugal and Greece are in the same boat. They both need financial assistance. After two years, James felt at home in Prague. Ryan is not in his father’s good books right now because he scratched his car. I’d avoid talking with Bob today. He must’ve got out of bed on the wrong side. Roger is an up-and-coming hockey player from Toronto. One day, out of the blue, I received a letter from my former schoolmate. In a TV interview, the politician set the record straight about his experiences in the military. The security guard kept an eye on the suspicious man. Because of a grey area in his job description, Peter was not exactly sure what all of his responsibilities were. Luckily for her, the policeman let Jane off the hook for parking her car in a no-parking zone. Jim was happy when his ex-girlfriend moved out of his apartment — out of sight, out of mind. = this means that if you do not see someone regularly, you will stop thinking about them. Ted gave his ex-girlfriend the cold shoulder when he saw her at the party. It took Alan a year to learn all the ins and outs of his job. The fireman said that injuries were common in his line of work. I forgot to buy groceries so I had to make do with what was left in the fridge. A: Keith, there’s something I need to get off my chest. B: What’s bothering you? Tell me. = to say something serious or difficult that you have been thinking about for a while. Takeshi knows the streets of Kyoto like the back of his hand. After scoring their fourth goal, the victory was in the bag. Greg isn’t on the ball today. He keeps making silly mistakes. Tara and Mike have been seeing each other off and on for a year now. I plan to move into my own apartment in September. For the time being, I’m staying with friend Doug. Alan got the sack for repeatedly coming into work late. The project was put on the back burner while the company focused on a more immediate problem. After being fired and then kicked out of his apartment, Jake really hit rock bottom. Everyone agreed not to talk shop at the staff party. It’s time we start the ball rolling on the new project. Janice took a position as an administrative assistant to get her foot in the door at the famous fashion company. Lloyd comes from a well-to-do family. His friends often ask to borrow money from him. Lisa had to work extra hard because a few members of the team weren’t pulling their weight. I have a gut feeling that something bad is going to happen today. If need be, we can take a taxi home. Their car broke down in the middle of nowhere. Jake didn’t want to go to another bar, but everyone else did, so he went with the flow. If Linda plays her cards right, she could be the department manager by next year. Bill chose to follow in his father’s footsteps and become a dentist. Alan has his heart set on participating in the 2020 Olympics. A: I met your boss today. He’s a real jerk. = expression that means that you definitely agree with what was just said. A: Doug, I’ve discovered the meaning of life. After some small talk, the interview began. Greg had to put his weekend plans on hold and go into the office on Saturday for a few hours. The two boys had some common ground: they both loved football. Marcel told a politically incorrect joke at the company party. No one laughed. If we want to finish this by Friday, then we’ve really got our work cut out for us. Mike and his father don’t see eye to eye on the issue of abortion. I really had to twist my sister’s arm to get her to pick me up from the airport. The report brought some previously unknown facts to light about the causes of cancer. Most of the employees were kept in the dark about the merger until the last minute. After breaking his leg, Darryl’s dream to play professional hockey went up in smoke. After his wife divorced him, Victor’s life really went downhill. With the World Wide Web, people have a vast amount of information at their fingertips. The kids poked fun at George because he was wearing his t-shirt backwards. A: You should get a girlfriend who’s beautiful AND kind. B: Easier said than done. = expression that means that sth is much easier to SAY than actually accomplish. The boss told Janet to call the shots while he was away. Hank knows every Elvis song by heart. If we don’t get a move on, we’ll miss the bus. Although their enemy outnumbered them, the soldiers stood their ground. = to stay in your position without running away. The tennis match was child’s play for Ben. The scientist said it’s only a matter of time before a big earthquake hits California. Francine’s short skirt raised a few eyebrows. The best restaurant in Europe is, of course, a matter of opinion. A: Tyler is such a selfish guy. B: Be that as it may, he’s your brother. You have to love him. If push comes to shove, I’ll be here to support you. Against his better judgement, Jim let his friend drive home drunk. To add insult to injury, Greg’s wife left him for his best friend. When the boss told me to come in to work on Saturday, that was the last straw. Jim’s vacation plans were still up in the air. I don’t have the faintest idea where Wollongong is. Paula enjoyed the concert, and getting to meet the artist backstage after the show was the icing on the cake. The singer was stuck in a rut. All of her recent songs sounded the same. Kate is a waitress at a run-of-the-mill bar and restaurant in London. Tina knew that one day her parents would see her tattoo and then she’d have to face the music. Bodyguards kept the reporters at bay while the movie stars entered the theatre. People were up in arms [about/over] the government’s plan to raise the retirement age. Jack bit his tongue while his manager criticized his performance. The design of our office building leaves a lot to be desired. Mike and Mary had dinner a quiet restaurant off the beaten track in Paris. Mike is a marketing genius. People often invite him to lunch or dinner so they can pick his brains. The 30-second trailer was designed to whet people’s appetites. A: People with nice cars just want attention. B: That sounds like sour grapes because you can’t afford one. Losing his job turned out to be a blessing in disguise. Afterward, Roger found his dream job. I told the teacher that it wasn’t me who broke the window. Thankfully, he gave me the benefit of the doubt. Jeff said he couldn’t remember the song’s lyrics, but hearing the first few words jogged his memory. George agreed to foot the bill for dinner. A: Why are you hiding from your brother? B: He has it in for me. He knows I lost his football. The company has been in the red since September. Once the school principal caught wind of the problem, she called a teachers’ meeting. As a rule of thumb, I don’t eat food that smells bad. After her holiday, it took Kate a few hours to get back up to speed on the recent developments in her company. Although Jim is against the death penalty, he told his friend he was for it just to play devil’s advocate. Lisa bent over backwards to get her brother a job in her company, so she was surprised to learn he quit today. take the plunge Jerry has finally decided to take the plunge. Tomorrow he’s going to start looking for an office job. When Mike heard his friend say she knew all of the world’s capitals, he called her bluff and asked her to name the capital of Mozambique. Tim has had a chip on his shoulder about businesswomen since he lost his job to a woman three years ago. Jim found it hard to focus on his work with his boss breathing down his neck. Mark’s visa application was held up for six months because of red tape. When his father died, Mark was given free rein to do whatever he liked with the family business. Getting into Harvard Law School became the be-all-and-end-all of Tony’s existence. The media blew the story out of proportion. bury the hatchet Susan and Mike agreed that it was time to bury the hatchet. They apologized and decided to be friends again. Can’t find an idiom? See page two. Want to study more? Take the idioms quiz. Copyright Matthew Barton, July 2011, of Englishcurrent.com. Do not remove website name or URL from printable materials. can u give me the mean of rettled the rooftop like thunder. rettled isn’t a word. you probably mean ‘rattled the rooftop like thunder’. this means the rooftop shook like it was in a storm. Please view page two (https://www.englishcurrent.com/idioms/english-idioms-list-page-2-student-requests/) for the definitions of some of those idioms. Please view page two (https://www.englishcurrent.com/idioms/english-idioms-list-page-2-student-requests/) for the definitions of those idioms. I need to know few idioms that can be used in regular to beautify the flow of language. Can you please guide me with that. 1)A leopard cannot change its thoughts. 2)A house divided against itself cannot stand. 3)A drop in the bucket. 1) I don’t know this expression. Try Googling it. It may mean something like “stubborn people cannot accept the ideas of others” but I’m not totally sure. 2) “A house divided” means a house with inhabitants who have different opinions amongst themselves. They are “divided” (in opinion). Such a house, which is full of disagreement, cannot “stand”. This means it will not last long; soon the house will fall or the people will become unhappy. 3) I really need to see the whole sentence to give you the exact meaning. But generally, a drop in a bucket is used to describe something that is very small and almost insignifican (compared to the size of the bucket). For example, donating $10 dollars to Africa is just a drop in a bucket (it’s such a little amount compared to the amount of help that is needed). I am afraid it is not “A leopard can’t change its thoughts”, it is “A leopard can’t change his spots”. It means someone who has born with a evil nature cannot change. It is a quote from The Holy Bible- Jeremiah 13:23. I’m glad to hear it! Thanks for your support! For a change add idioms like catch a cold, slow boat to china, pie in the sky and toot your own horn and many more idioms for kids and more this was just not helpful try changing it for good comments. As per the title of the page, this is a list of *useful* idioms for people in North America. It is not meant to be a list of all the idioms in the English language. Thank you, sir. Being a english teacher it has really helped me. I can make my students to understand and speak fluently in english. thanks a lot. expecting more notes from you. englishcurrent.com is very useful site in terms of increasing vocabulary strength.please continue to update matters relevant.thank you. be much better off than. Sorry. I cannot do all of your homework for you. Please try searching the idiom + “meaning” on Google. You will usually get results. Many of those are not idioms. 1 = bits and pieces literally means something has broken up into small pieces. For example, “I will try to pick up the bits and pieces of my shattered life.” means your life was broken into pieces, and you are trying to put it back together. 5= ‘to fall prey to something’ means to become the victim of something. The others don’t sound like idioms to me. Without context, I am not sure if they have any meaning other than their literal meaning. Good luck. I might be able to shed light (help you understand) on some of these. Mb, are they specifically British then? Number 4, ‘passing through’ is a phrasal verb – in its literal form it means ‘not stopping’ i.e. the train is passing through the station. And in it’s phrasal form, it means ‘won’t be around for long’ e.g. Ben has a new girlfriend but knowing him she’s only passing through. hey everybody!! can i use these words as a set expressions?? Most are set expressions. Generally, you can’t change the words in these idioms. Otherwise, the expressions will lose their meanings. For quick answers, you can just search “three dog night idiom” on Google. I’d never heard of the expression. According to the web, it means a night that is so cold you need to sleep with 3 dogs in your bed to keep you warm. All the selected phrases written by you are very useful for me as well as all the readers, teachers and the students of English Literature and Language. I am very happy to read these idioms and phrases and being a very ordinary writer I Wii use these phrases to make my sentences meaningful and impressive. Thank you very much sir for providing us these materials to read and we religiously share these beautiful phrases to our good students. Congratulations & Thanks once again & hope we will get more new phrase in this website in the days to come. I’ve printed this idioms to improve and speak just like American native speaker . it was one of the most interesting and informative sites i have ever visited. I learned so many things about the meaning of idioms. Can you please say me the meaning and sentence of the idioms and phrases. Hello. If you click on the link “Definition”, it will show you the meaning. In this site learning idioms is a piece of cake !! Thank you so much!! Great list – I was losing hope of finding something like this and thinking I would have to do my own! Many thanks for putting in the effort and saving me a lot of time! kindly tell me the”mind of books”. Hmm. I’m not sure. Can you give me a full sentence as an example? i am totally impressed with your precious collection…. even though its a best and splendid site i have ever seen….but i think you should add more plzzzz ,,best of luck. These idioms aren’t peculiar to North America, as the author seems to suggest, they are also commonly used in the United Kingdom. It's really good one!!! where have learned English phrases and idoms. looking for idioms to face an examination tomorrow. this site have helping me little bit :) wish me luck. Wow! This really is a great website! Knowing all of these idoms by heart would be a great project for my Easter vacation. They will be very useful for my exams in may! Can you find someone to speak with in your town or city? Maybe there is an English conversation group. Really helped a lot. Thank you. Could you help to find the meaning of “perhaps, its just as well”? A: I didn't go to the party yesterday. B: It's just as well. Your ex-girlfriend was there. The meaning is that it is lucky/fortunate that you didn't go because if he had gone, he would have met his ex-girlfriend (the alternative), who he dislikes. 1) "I'm way ahead of you in the game of life" means that I'm at a higher stage/level than you are in life. For example, if you are still a high school student and I'm already in university, you could say that I am 'ahead' of you in life. Whoever said this to you was bragging and staying that his/her life is better than yours. 2) marital satis = marital status. Your marital status is either 'married' or 'single'. can you help with the expression "pull the plug" and "walking disaster" ? Hi Mikey. Not all sentences have idioms. Idioms are words that have special meaning when put together. For example, if I say that you are "all ears", it doesn't mean that you are literally completely ears. The words 'all' + 'ears', when combined, mean that you are listening. This is a special meaning. Most idioms are not sentences. Sentences contain a subject and a verb. Most idioms are just expressions that are used within a sentence. For example, "I went crazy". The idiom here is 'go crazy', but it does not include the subject "I". “pay attention” instead of “attend to” – Why “Pay”? What gives it a commercial aspect and is this purely American? ‘attend to’ has a different meaning in North America. Consider: “Pay attention to the teacher.” and “Attend to the teacher.” In North America, the latter would mean to take care of the teacher. Yes, these idioms are North American, hence the title of this page. As to why we say ‘pay’, your guess is as good as mine. can you help with these idioms. Please view page two (https://www.englishcurrent.com/idioms/english-idioms-list-page-2-student-requests/) for the definition of that idiom. Perfect, very usefull, but how can I save to my computer. I think you are very good in your field. and I miss you. Thank you. There is a link above to a .DOC file you can download for free. The link is before the first idiom. all of the above idioms are just good to memorize but is there any common idioms which can be used in a normal conversation. ?? Sir, can u please help me with this one-against your grain along with its usage.? That does not seem to be an idiom. Comments are now closed. Please view page two (https://www.englishcurrent.com/idioms/english-idioms-list-page-2-student-requests/) to make a comment or request a definition of an idiom. This is a great page, you helped me a lot. 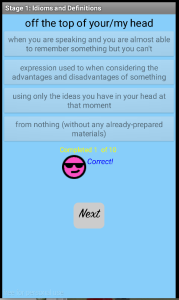 I took your first 100 idioms and i did the phonetic symbols for the example sentences. note: i checked twice but if you find any error please tell me. Wow. That looks like a lot of work. Did you do it as an assignment as part of a course you are taking? Or are you just interested in IPA and teaching pronunciation? Those aren’t really idioms. Body and soul usually means literally someone’s body and soul (e.g. I love him, body and soul.) A pat on the back is also usually literally patting someone on the back. We do this to congratulate someone. This is by far the best compilation of idioms i have come across online and its downloadble!! Thank you very much for this. It would have been so much better if the downloaded doc could show the meanings too and not just the idioms and their usages. Can you please look into it? Thanks again! I’m not sure we have an idiom that matches this. However, if you said that (“Only a jeweller knows the worth of a diamond.”), it would make complete sense (and it sounds nice). Comments are closed. Please visit our forums to ask a question.